So there I was, Bib, and all important Goody Bag secured, ready to explore the Quality of Life Expo, and so I did the logical thing, and went to the SE corner and began to work my way up 1 aisle and down the other, to the other side of the room. What follows will be a chronicle of the booths I visited, and their websites, if any, and the pictures I took of the excursion. Booth after booth, after booth of running, and cycling clothing, of running, and cycling event organizations ( Some related to charities. ) from across the nation, and around the world. Booth, after booth, after booth of health food products, energy bars, drinks, and gels by the dozen! I stopped by the Tour de Cure booth, and learned about the rides in May, in Long Beach ( 15, 35, 65 mi. ), and Thousand Oaks ( 5, 30, 62 mi. ), to raise money for the American Diabetes Association. A visit to the booth of South Africa Tourism, and African Travel Inc., picking a couple of informative booklets that may lead me to add some links to the international section of the sidebar. The Mammoth Lakes Visitors Bureau booth had a nice brochure, a map to the area that is very useful for cyclists of both the Road, and MTB, persuasion, and info about Mono County. I met a man who is with the Inyo County Transportation Commission who gave me a map of the route Wild Wild West Marathon and Ultra Marathons that is a decent starting point for any cyclist to learn about riding opportunities in the area. It is a sure bet that radio stations will have booths here, and maybe a Campaign on behalf of a local, state, or Presidential candidate, as well. As regular readers may know I am a Moderate Republican. 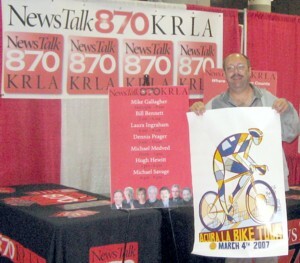 I am not the only Conservative Cyclist out there on the street, or in the BikeBlogosphere, and so seeing the local affiliate that carries Hugh Hewitt, Bill Bennett, Laura Ingraham, Dennis Prager, Mike Gallagher, Michael Medved, and Michael Savage, set up a booth in such a place should not be such a surprise to anyone. To all those who think that such a spectacle is the equivalent of finding a MoveOn.org booth at a National Rifle Association Convention, I can only say... take a deep breath, calm down, and RELAX already! This is the station's 3rd year at the Expo, and one person manning the booth told me of at least one station employee who commutes quite a way to, and from, work, by bike. As bicyclists we have much in common, and cyclists of my, um, persuasion, have much to share, and say, about our shared recreational, and commuting, activity that cyclists of all varieties have shown me, over 4 years, they like, and agree with. It is also almost a sure bet that somewhere at an event like this, God, or some other Diety of some repute, ill, or otherwise, will be found holding down a booth. Walking around I was amused to discover that you could get some part of your anatomy massaged in every aisle, and get proseletized by the Dianetics Crowd, and Christians, just 1 row apart. I know there are Christian Cycling Clubs out there, and it would be nice to see them promote their efforts at events like this. 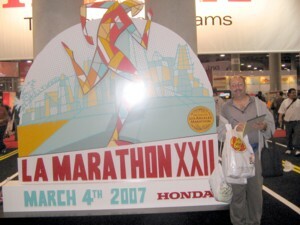 As you can see from this photo I was working the room quite hard filling several bags with freebies. I found food related brochures, and freebies, of interest, such as samples of Mahatma Brown Rice, Jelly Belly Energizing Sports Beans, Natural Path Organic Wheat Bran, and Robeks Powerbek Dietary Supplements [ Robeks! The Official Fruit Smoothie of this whole darn shindig, don't ya know! ;-D. ]. For my Inner Healthfood Fanatic: A booklet from Diamond Nuts. Latin Flavor in the Kitchen by the American Diabetes Association. Tumaro's Gourmet Tortilla Wrap Recipes. For my Inner African-American: The New Soul Food Recipe Sampler, also by the ADA. Time out whIle I go fix, and eat, dinner!